Baby B is one lucky little boy. We kicked off the celebration of his pending arrival with our first of three baby showers. Sunday’s shower was thrown by my aunts and mom, at my parents’ new house. I first have to say that I absolutely loved the invitations. Not your traditional baby shower invitations, they had a pretty, rustic feel, very similar to the style of our home. These invitations were ordered online at zazzle.com. When I walked into the party, I couldn’t help but be drawn to the beautiful table arrangements. Our Michigan weather did not agree with the original plan of being outdoors, so my mom decided to set up inside. Fortunately, she had the room to move things around and accommodate all 30 guests! The shower had a book theme, which was carried beautifully throughout the event. The first place I noticed this was on the tables. My mom had made these awesome, little bookmarks with different book covers on each one. They were laid atop the china at each place setting. Lunch was served buffet style–a delicious spread of Mediterranean food. Being gluten-free, the chicken, veggies and rice were right up my alley. It was all so yummy! Of course, lined up along the food were books with titles that related to each option. For example, a children’s book entitled “Big Chickens” was placed next to the chicken kabobs. It was a simple touch that really tied everything together. Once lunch was finished, it was game on. The object of game was to come up with the title of the book from which each quote was taken. It was really cute to watch the ladies wrack their brains for the titles that they knew they should know but hadn’t read in years. The idea came from this website, but was altered slightly by the hostesses. Ultimately, my cousin Kylie got 16 out of 20 correct and won a mason jar of sweet treats. Dessert was set out next. My mom has always made the most impressive sugar cookies. 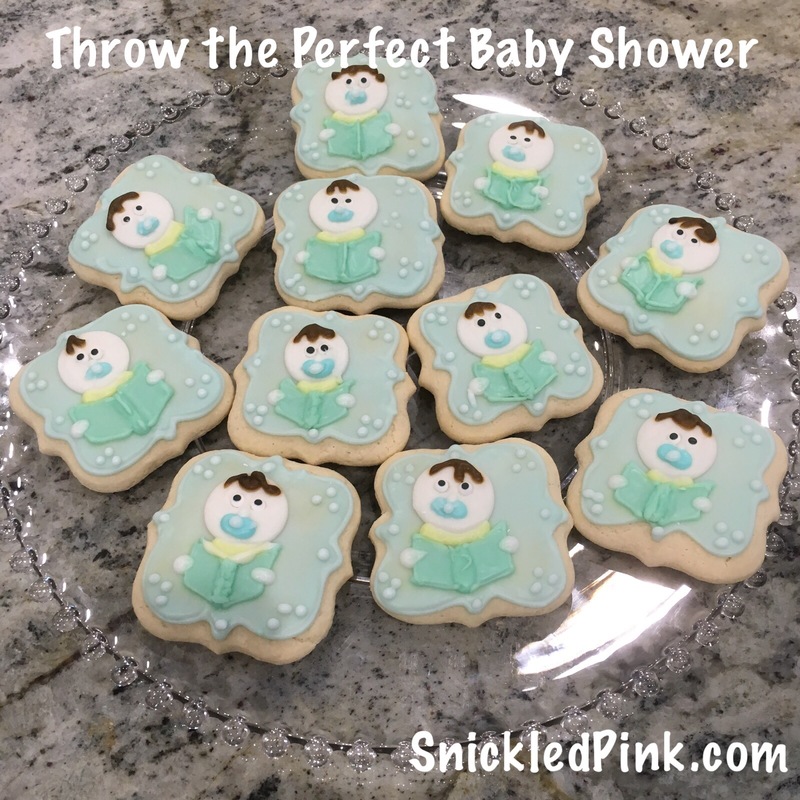 She really outdid herself this time with these adorable baby boy cookies though. They were almost too cute to eat! She also made chocolate cupcakes and picked up my favorite cherry cheesecake from our local bakery. To top it all off, the whole spread was gluten free! I was in heaven. This group of women was so incredibly generous. Baby Bogen was showered with gifts, all of the fancy gizmos and baby essentials that we’d put on our registry. I was so excited to open these things that I’ve been dreaming about since my trip to Buy Buy Baby. I got a few unique, hand-selected gifts that made me laugh and made me cry. Can we please talk about this University of Michigan pacifier? “Class of 2036?” Holy moly. We also received some beautiful homemade sweaters and blankets that were just incredible. I lost my composure when I reached into one gift bag and pulled out my baby blanket from 29 years ago. My sweet grandma had mended the holes and fixed the strings, and now my baby is going to get to use that same blanket. There are no words for what they means. As the party came to a close and guests made their way out the door, they grabbed a delectable, homemade chocolate chip cookie. Isn’t this such a cute idea? I sure loved it and so did the guests. As a side note: My shower dress was purchased from my new favorite spot, ASOS Maternity, and can be found here. While I wanted to share with you the details of Sunday’s shower because it was stunning and perfect, the best part of the day was all of the love that was shared. The support that we felt on Sunday, and every day really, means more than I could ever express. It’s the reason why I know this baby is going to have the best life that any little man could have. I forgot to write in the book!